It's Summer Sale time in London! In fact, High Street stores across the country have been running continuous sales for some months in an effort to shore up faltering business in this period of economic gloom. If you brave the crowds of Oxford and Regent Streets, you will find bargain basement prices for quality clothing essentials or trendy gear in stores like Cos, (222 Regent Street, Tel: 020 7478 0400); the US store chain Gap, (376-384 Oxford Street), and its associated company Banana Republic, (224 Regent Street, Tel: 020 7758 3550); H&M, (481 Oxford Street); Marks & Spencer, (458 Oxford Street); New Look, (500 Oxford Street) and Topshop, (216 Oxford Street), to name but a few in London's busiest and probably oldest shopping street - it began as a Roman road nearly 2,000 years ago. In the more rarefied areas of Mayfair and Knightsbridge, where top British, French and Italian Fashion houses maintain their ever elegant presence, the annual summer sales are held with more restrained decorum and the price tags reflect the exclusivity of their fashionable names. But the top names must also clear their racks for Autumn season displays, so to top up your summer wardrobe and accessories now at bargain discounts of up to 75%! While well-heeled ritzy ladies were showing off their glitzy ensembles and millinery creations at Royal Ascot last week, I was trawling the fashion emporia, department stores and exclusive boutiques of Knightsbridge and Sloane Street to suss out the upcoming sales. I found some mouth-watering bargains. Nearest Underground: Knightsbridge, (Piccadilly Line); Sloane Square, (District and Circle Lines). Address: 109-125 Knightsbridge, SW1 (020 7235 5000). Look for: 50 % off selected designer brands at 'Harvey Nick's' iconic flagship store. Alexander McQueen, Balmain, Brian Atwood, Giles, Lanvin, Marc Jacobs, and Rodarte are names that spring to mind. Deduct an extra 10% if you are an Account Card holder. Online shopping facility. Subscribe to in-house fashion news and store events e-zine. Alexia's tip. Pause for lunch at the Fifth Floor restaurant and browse through Daylesford Organics goodies in the adjacent food market. Their delicious red onion and Apple chutney will be a welcome addition to your summer picnic hamper. Gucci International Italian Accessories label. The ultimate in bling. Address: 18 Sloane St, SW1. (020 7235 6707). Sale Date: Until 1 July, 2009. Mon-Sat 10am-7pm. Sun 11am-5pm. Look for: 50% off selected bling accessories. Jimmy Choo Own label fashion Shoe and Bag Designer. Address: 32 Sloane Street, SW1. (020 7823 1051). Sale Date: From 27 June, 2007. Mon-Sat 10am-7pm. Look for: 30-50% off Spring/Summer collection. Choose from over 50 elegant shoe/handbag offers. Online shopping facility. Browns Top fashion label womenswear. Address: 6c Sloane Street, SW1X 9LE2. (o2o 7514 0040). Sale Date Until 18 July, 2009. Mon/Tues, 10am-6.30pm; Wed, 10am-7pm; Thu-Sat, 10.30am-7pm. Look for: Up to 50% reductions on designer clothes, shoes and accessories, (Balenciaga, Bloch, Christian Laboutin, Damian Hurst for Levis, Dior Homme, Jil Sander, Poltock & Walsh, RAF, etc). If you have not already discovered it, check out Browns 'Labels for Less' at 50 Molton Street, Mayfair, W1K 5RD, which carries designer labels at permanently discounted prices. Pringle of Scotland Historic own Label Cashmere Fashion house. Address: 141-151 Sloane St, SW1x 9AY (020 7297 4580). Sale Date: Ongoing, 2009. Daily during sales period 10am-6.30pm. Thurs 10am-7pm. Look for: Up to 30% off selected items. Address: 152-153 Sloane St, SW1 (020 7823 5348). Sale Date: From 24 June, 2009. Mon-Sat 10am-6pm. Wed 10am-7pm. Look for: 60% off Summer collection items. Alexia's Tip. Two doors down from Chlo� is one of my favourite perfumier Jo Malone at 150 Sloane Street, (020 7730 2100). Find time to browse in this delightful shop and sample the Malone fragrances and skincare products. Frequent flyers depend on Jo Malone's 'In-flight Travel Bag of Essentials': vials of Ginseng Day Moisturising Cream; Green Tea & Honey Eye Cream; Protein Skin Serum; Rosemary & Lavender Skin Tonic; Avocado Cleansing Milk; Vitamin E Gel; Lime Basil & Mandarin Body Lotion; Grapefruit Cologne. Address: 162 Sloane St, SW1X 9BS. (020 7245 9331). Sale Date: From 24 June, 2009. Mon-Sat 9am-7pm. Look for: Up to 50% off Own Label Collection and Red Carpet Couture from this elegant and sophisticated designer. Chanel Boutique International French Haute Couture Fashion, Accessories and Fragrance Label. Address: 167-170 Sloane Street, SW1. (020 7235 6631); 278-280 Brompton Road, SW3 2AB. (020 7581 8820). Concessions at Harrods and Selfridges. Sale Date: From 27 June-11 July, 2009.Mon-Sat 10am-6pm. Look for: 30-50% off previous Chanel collection items and selected items from this year's Spring-Summer collections. Address: 171/172 Sloane Street, SW1 (020 7235 6706). Look for: 50% off selected items from Spring/Summer 2009 collection. Gianni Versace International Fashion & Accessories Label from Italy. Address: 183/184 Sloane Street, SW1 (020 7259 5700). Sale Date: Ongoing, 2009. Mon-Sat 10am-6pm. Look for: 50% off Spring/Summer collection and some accessories. Online shopping facility for non sale items. Address: Sloane Square, SW1 (020 7730 3434). Sale Date: From 26 June, 2009. Mon-Sat 9.30am-7pm, Wed 9.30am-8pm, Sun 11am-5pm. Look for: Up to 50% off selected items across the store. Bigger discounts on Seconds and 'reduced to clear' stock. Nearest Underground: Knightsbridge, (Piccadilly Line). The Cashmere Shop Cashmere specialists. Address: 43 Brompton Rd, SW1. (020 7823 9300). Sale Date: From 23 June-15 July, 2009. Mon-Sat 9.30am-6.30pm. Sun 10.30-5.30pm. Look for: Up to 50% on selected cashmere and silk & Cashmere items. Zara International Spanish Fashion Multiple. Address: 79-81 Brompton Rd, SW1. (020 7590 6960). Sale Date: From 29 June, 2009. Mon-Sat 10am-8pm. Sun 11am-6pm. Look for: Up to 40% off summer collections. Excellent kidswear. Address: 87-135 Brompton Rd, SW1. (020 7730 1234). Sale Date: From 27 June, 2009. Mon-Sat 10am-7pm. Look for: Up to 75% discounts throughout the world's most famous luxury store. The man in your life should check out any offers in the newly opened Louis Vuitton men's department while you are browsing for couture, accessories and lingerie bargains. I have my eye on a 'Just Cavalli' leopard print shoulder bag. The Harrods Homewares and Furniture Sale is always worth a visit. You can sneak preview what's on offer on the website. Onliner shopping facility. Alexia's Tip: Sustain yourself with a glass of champagne and a plate of oysters at the Harrods Oyster Bar in the Fish Hall while you deliberate on whether to take home a lobster for dinner. Address: 138 Brompton Road,SW3 1HY. (020 7584 9368). Sale Date: Closed for complete shop refit. Reopening this autumn. Online shopping facility with 30% discount on some Naughty Janet items. Emporio Armani Italian Multiple, Own Label. Address: 191 Brompton Rd, SW3 (020 7823 8188). Sale Date: Ongoing.2009. Mon, Tue, Thur, Fri 10am-6pm, Wed 10am-7pm, Sat 10am-6.30pm, Sun 12noon-6pm. Look for: Up to 50% discount on Giorgio Armani lines. Online shopping facility. Address: 311 Brompton Rd, SW3 2DY. (020 7589 7884). Sale Date: Until end July, 2009. Mon-Fri 10am-6.30pm; Sat 10am-6pm. Look for: Own Label Designer Fashions. 50% off all items in Spring/Summer collection. If you dare wait that long, 70% discounts from third week July. Nearest Underground: Knightsbridge, (Brompton Road exit), (Piccadilly Line). Sale Date: From 24 June, 2009. Mon-Fri. 10am-6pm; Sat 10.30am-6pm. Look for: Up to 50% off Own Label Day and Occasion dresses. Bruce Oldfield OBE British Fashion legend. Own Label Designer, Red Carpet Couturier. Sale Date: From 23 June, 2009. Mon-Fri. 10am-6pm; Sat 11am-5pm. Look for: Up to 50% off Couture red Carpet dresses, silk summer dresses and party dresses. Sale Date: No scheduled Summer Sale, but items on sale from time to time. 2009. Mon-Fri 10am-6pm; Sats 11am-6pm. Look for: Stunning red carpet dresses from this elegant Red-Carpet Couturier. Address: 56/57 Beauchamp Place, SW3. (020 7225 3197). Sale Date: From 24 June, 2009. Mon-Sat 10am-6pm. Look for: Up to 50% off current Studio, London and Caroline Charles Designer Collections. Some special 75% discount bargains. Good news for us Jimmy Choo fans. The iconic shoe designer who first burst upon the fashion scene around Princess Diana's feet back in July 1981, has teamed up with the H&M multiple to produce their first High Street collection of elegant ladies and men' shoes, bags and accessories. Expect to see them in 200 H&M outlets from November at about �30 for a pair of ballet pumps and �170 for a pair of boots. Alexia's Tip: Book yourself into Groom at 49 Beauchamp Place, (tel: 020 7581 1248) for "Zone Out". I recommend this blissful hour of pampered relaxation and rejuvenation by two therapists who will massage away the effects of your Knightsbridge Sales slog. The treatment stimulates nerve ends at key points in your body, relieving the built up tension of the day. Starting with the feet, legs, head and shoulders being massaged simultaneously and ending with each therapist working on a hand and arm, the unique sensation of two zones being worked on at the same time produces a WOW factor that will have you ready to party in that Bruce Oldfield silk summer dress you picked up just down the road. 187 Sloane Street,SW1x (020 7258 8513). 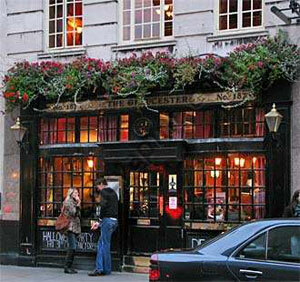 It is a pleasure to find a genuine traditional pub nestled among Sloane Street's fashion and jewellery emporia. When they gave this pub a make-over and added a charming new frontage a few years ago, I feared that they would transform one of my favourite watering holes, into an expensive restaurant or cocktail lounge. Happily, 'The Gloucester' remains true to its classic pub traditions and clientele. It remains a welcome haven for husbands and lovers who are squiring their ladies down the expensive length of Sloane Street, and no doubt picking up the tabs at the other end! The pub is a member of the excellent Punch Group of Taverns and boasts 'Cask Marque' status, which means they draw a fine pint of 'Real Ale' beer. The 'nosh' is good too...Fish & Chips, Bangers & Mash, Steak & Kidney Pie - traditional Pub Grub! Expect to pay just �10-�12 for your food and a pint of 'wallop'. Here's Mud in Yer Eye! © 2009 offtolondon.com All rights reserved.